The Stirling Engine is a sealed high efficiency “heat engine” that is driven by the radiant energy supplied from the sun or any other source of external heat. Invented by Robert Stirling, hence its name, nearly two hundred years ago, the Stirling cycle engine is a type of solar engine, or sun motor, which operates using the principal of thermodynamics alternating between the hot and cold temperature cycles of a working gas. The “Stirling Engine” consisted basically of an externally heated, usually by the sun, hot-air engine controlled by what Robert Stirling termed as an “economiser” that absorbs and releases heat to and from an enclosed internal air space. When the air (or some other form of working gas) inside this enclosed space is heated it expands, and when it is cooled it contracts. A piston is driven by compression or expansion of the working gas typically helium or hydrogen which never leaves the engine. So the Stirling engine works by alternately heating and cooling of the gas by an external heat source, extracting energy from the gas’s expansion and contraction. This results in a pressure change that is used to power a piston inside the engine cylinder in much the same way as a Rankine steam engine operates. The difference this time is that it uses a gas rather than steam to drive a piston. This highly efficient solar thermodynamic heating machine converts the temperature difference (thermal energy) into mechanical power (kinetic energy). We can see that a Stirling engine is a thermal solar power reciprocating piston engine that uses solar radiation to produce heat in place of traditional fossil fuels. The free piston Stirling engine uses the oscillatory behaviour of two pistons of different mass, the heavy one being delayed by half an oscillatory period with respect to the lighter one. An electrical generator is directly coupled to the Stirling motor shaft, which converts the mechanical energy into the desired AC electrical energy and as such is a system in which temperature differences plays a significant factor. The power output of the Stirling motor is mainly controlled by varying the working gas pressure inside the piston cylinder. Sunlight contains many thousand times more energy than us humans can use but harnessing this free energy can be expensive. The most common method, is to use photovoltaic cells, which turn the sunlight directly in electricity. But we can also use the sun’s immense power to heat water and fluids either directly or by using mirrors to reflect heat onto Stirling engines, which in turn moves pistons to generate power. But to get the sun’s heat to a temperature high enough to operate a Stirling engine generator, it is necessary to concentrate the solar radiation. Concentrating solar power (CSP) systems use parabolic dishes, parabolic troughs and solar power towers to focus the suns power onto a central receiver. The concentrated solar energy converts the sun’s energy into high-temperature heat that can be used to generate electricity. Generally, trough-shaped parabolic concentrators and power towers require water to produce steam which drives a steam turbine to produce electricity, but no water is required for a solar dish/engine energy system. Dish solar power uses a two-axis prime-focused parabolic dish to concentrate solar energy into a receiver. The receiver absorbs the solar radiation reflected by the concentrator and converts it into useful heat transferring it to the heat engine/generator. Parabolic dish-shaped mirrors focus the sun’s solar energy onto a receiver at a concentration ratio of over 2,000 suns to heat a transfer fluid inside the solar engine to more than 1,000oF. Thus, the highest temperatures of the system occur at the receiver and as such Stirling engine generators have a relatively large heat to electrical power conversion ratio. Individual two-axis tracking dish/Stirling systems track the suns movement across the sky throughout the day and focus the solar intensity. The sun transfers its heat to the enclosed air, or usually a gas such as hydrogen or helium, to power the Stirling engine positioned at the focal point of the collector. The Stirling engine design produces a turning movement, which runs an electrical generator creating electricity. Stirling engines are ideally suited for solar thermal power since this type of solar engine generator design requires the Stirling motor to be part of the collector assembly. These parabolic dish systems are usually smaller than the parabolic trough systems and can compete with the less efficient photovoltaic panels for small scale residential, remote power or portable power generation type applications. The typical power output of current parabolic dish/Stirling heat engines are relatively modest as are their output power typically ranges from no more than a few kilowatts up to 20kW, for a dish diameter of about 10 meters. However, these dish/Stirling engine systems are modular in design as each system is a self-contained power generator, meaning that they can be connected together to produce solar arrays ranging in size from a few kilowatts to many tens of kilowatts. 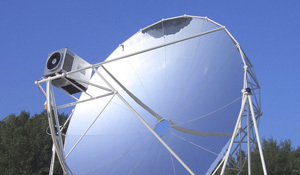 The solar concentrator (dish) is a key element of any solar dish and Stirling system. The ideal concentrator shape is a concave-shaped paraboloid, covered with small spherically shaped glass mirrors, covered by aluminium or silver reflectors or reflective membranes achieving concentration ratios well over 1,000 suns. Solar tracking of the concentrator is usually done by polar tracking, where the concentrator rotates about an axis parallel to the Earth’s axis rotation. The most common type of closed cycle heat engine used in dish–engine systems is the “Stirling Engine”. But one disadvantage of a dish-Stirling systems is that it can not generate instant electricity since it lacks thermal storage quickly cooling down when not heated by the sun. It only works when the sun shines so can not produce electricity during night-time or in periods of bad weather. Also most Stirling heat engines require some time to warm up before they can start to produce any useful power. However, any electrical energy produced by a solar Stirling generator can be stored in batteries for future use. These free piston Stirling engine and solar based heat engine designs have historically not achieved widespread use, but the Stirling engine is back in fashion as there has been recent interest in this technology due to advances in technology and materials. Also due to the flexibility of the heat source, a Stirling engine can also be operated using a solar/natural gas or solar/biomass hybrid type thermal receiver if sufficient sunlight is not available. As a result, combustion heat from using either the sun, fossil fuels or biofuels can be used to drive the Stirling engine and generate electricity so it is expected that within a few years this type of technology is expected to be installed in every house taking the place of larger photovoltaic panels as part of a home power system helping to reduce energy consumption. One of the main advantages of the Stirling engine generator design is its quiet operation, since being an external combustion engine it has no controlling valves or spark plugs, requires little maintenance, and best of all being a closed system the working gases produce no environmental emissions. As well as electrical power generation, the Stirling engine can also be used as a prime mover (Stirling Motor) for pumped water systems and this can result in extremely high reliability as there are fewer parts to fail. To learn more about the Stirling Engine and how a Stirling engine works, or to explore the advantages and disadvantages of using solar heat engines and Stirling motors to generate electricity or pump water, then Click Here and order your copy from Amazon today about Stirling Engine Designs and building other types of hot air engine. Fukushima Daiichi Nuclear Power Plant could have used a bunch of these in the spent fuel pools to provide backup power. Would have eliminated need for the flooded diesel backup power plant and been a great primary backup with the batteries as a secondary. Why don’t nuclear plants use these at their spent fuel pools to produce backup emergency power? …. and supplement power production while all is good. All well and good article. BUT . . . where can I purchase a working Stirling that is larger than a toy. I need a 1hp unit. Can anyone tell where I can purchase a complete functioning large Stirling. About bringing it to South africa: we should start educating people. I was allmost shocked to see people in Turkey ( not so underdevelloped) living next to a reservoir-powerplant but to poor to have electricity. paying fuel for a genset while they had the right conditions nextdoor. Anoyher thing that might help is a standard voltage array. I would prpose 12 or 24 or 12-24 volts. mqking a 12 Volt alternator run with a Stirling engine could be a challenge though. A Stirling engine is a heat engine that operates by compressing and expanding a gas internally at different temperatures. One part is heated, usually be concentrated solar energy or the combustion of a fuel, and the cold side is cooled by fins or a liquid, usually water. If you can create enough temperature difference for the piston to move, ensure a constant speed, and reduce any mechanical and/or friction losses, then in theory there is no reason why you could not connect it to an electrical generator. You will need to find a supplier who can offer such a system tailored to your requirements. I am very impressed. How we can cooperate to bring that technology to South Africa? I see it as a possibility to supply electricity to thousands of poor who can not afford electricity.